Arkansas' 'Enhanced Concealed Carry' Allows Guns In Churches, Bars, State Capitol To get the permit, applicants have to pass a live-fire exam and take a class on what to do in an active shooting — on top of the original five hours' training for a basic concealed-carry permit. A February training class at the Arkansas Armory in Sherwood. Arkansas recently became the first state to require active shooter training for a gun permit. The state began issuing "enhanced concealed carry" permits earlier this year. The law creating the new permits, which passed last spring, allows enhanced carriers to bring guns into what the state calls "sensitive places," including public university campuses, bars, churches and the state Capitol. To get the new permit, applicants have to pass a live-fire exam and take a course that covers what to do in an active shooting. That's on top of the five hours of training required for a basic concealed-carry permit in Arkansas. The first step of the permit process is two hours at the shooting range. Applicants have to hit a static paper target — a bull's-eye superimposed on a silhouette of a human torso — 70 percent of the time. If they pass, they move on to a six-hour classroom session. 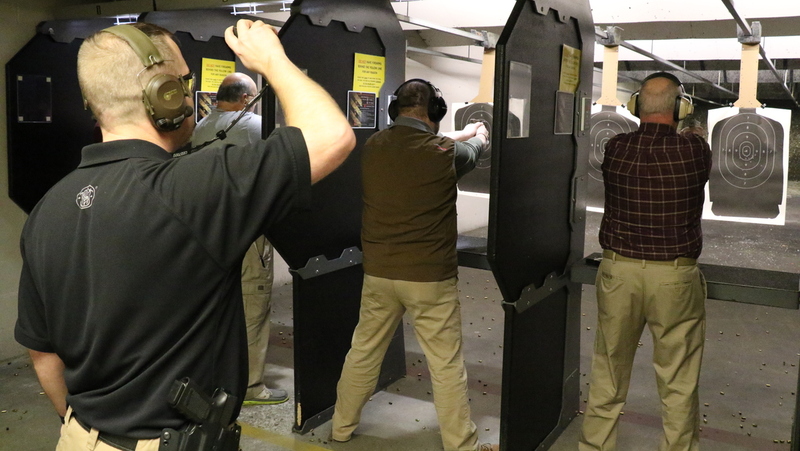 In a training session earlier this year, instructor Nathan House told the applicants that even if they are armed, their first response to a shooter should be to run — and to help others escape — to try to avoid a confrontation. But, he said, having that weapon gives you a last resort if you need it. "Make them come to you," House told the class. "If that active shooter decides that they want to come into that room where you are at, then you are prepared to defend yourself." House instructed the applicants to be careful to not shoot the wrong person, and then after firing, to put their gun away, so police don't think they're the shooter. Katrina Allen took the course. She is married with grown children and said she is a regular at the shooting range. Allen is not enthusiastic about using her weapon in a confrontation, but she said she'll stand up to a gunman if she has to. "When I decided to start carrying, I understand that I have a responsibility," she said. "More than just protecting myself, if I ever find myself in an active shooter situation, I do realize that I will take on the responsibility of protecting whoever is around me." Her classmate Seth Mikkelsen, a 26-year-old retail worker, said he won't hesitate. "The point of carrying and having a weapon available is, you know, to use it," he said. But that's not what the Arkansas State Police, who developed the framework for the license training, want to see happen. Spokesman Bill Sadler said a few hours of training for the enhanced permit shouldn't make people feel ready to go vigilante. He is worried that more people firing guns could make the scene more dangerous and confusing for the real police. "The licensee must be able to egress from the active shooter situation," he said, "and not necessarily become someone who is going to act as a law enforcement officer might." Some "sensitive places" that aren't publicly owned — like bars and churches — can opt out of the new law and ban firearms. First United Methodist Church in Little Rock has done just that. David Freeman, the senior pastor, says the self-defense mindset of concealed carry just doesn't align with the church's values. "It keeps us guarded and focused on fear and focused on 'what are dangers out there?' " he says, "rather than seeing the world through, 'What are the opportunities for love and to build community?' "
To some safety experts, like Cassandra Crifasi, a researcher at the Center for Gun and Policy Research at Johns Hopkins University, there are more practical concerns. Crifasi says eight hours is not enough training to handle the chaos of an actual live-shooter situation. She says physiologically, everything changes in a live situation, and there's a big risk of hitting the wrong person. "At the range or outdoors you're usually in very controlled settings versus being in a situation where there's lots of noise [and] ... there are innocent bystanders standing around," she said. On university campuses in particular, Crifasi says, guns are more likely to be used in suicides or interpersonal conflicts than to stop a mass shooting. But Republican state Rep. Charlie Collins, who sponsored the law, says the most important thing is to get guns in the hands of the right people. He believes more concealed weapons will deter mass shooters. If there is an attack, Collins says, "You have the potential for one of these enhanced concealed-carry holders to literally be on scene, and to be able to draw a weapon and shoot back." That, he says, will make Arkansas safer. In an earlier audio version of this story, David Freeman's first name was incorrectly given as Daniel.